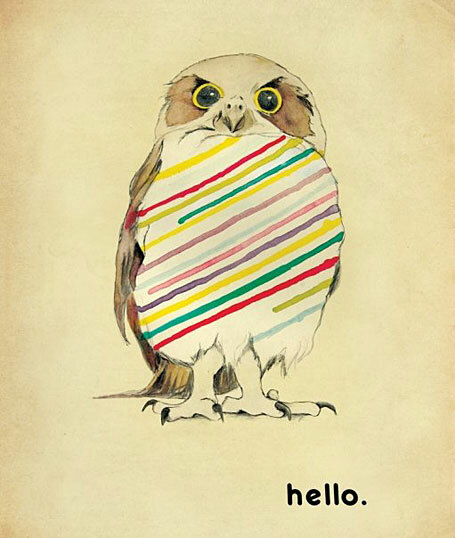 "Hello Owl" by Kareena Zerefos. 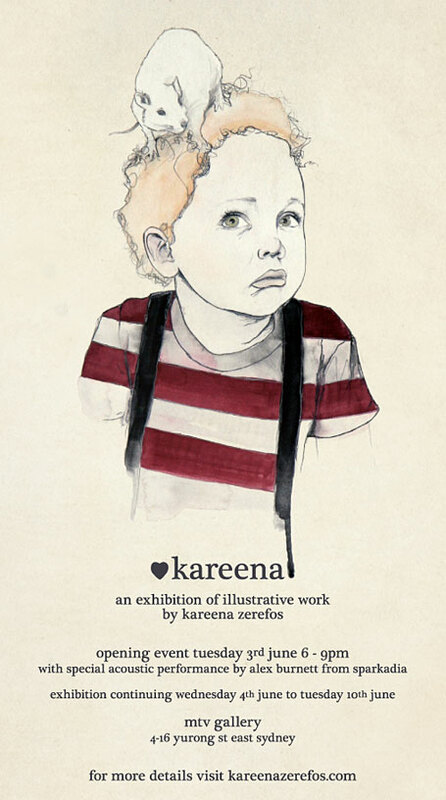 Kareena Zerefos is an incredibly talented artist & illustrator from Sydney. She has exhibited in a number of group shows this year, and her work has been appearing all over the place! She is responsible for the stunning artwork on the Sparkadia album covers, and many of you would have seen her work featured throughout Yen Magazine's Issue 31. (We also mentioned Kareena's work when we posted about the Grrrls exhibition at aMBUSH Gallery in February.) Kareena's first solo show opens next week, and she has taken a little time out from drawing to answer some of our questions, so read on! MTV Gallery flyer - an exhibition of illustrative works by Kareena Zerefos. I 1. Firstly, congratulations on your first solo exhibition! How are you feeling about the show? KZ Thank you! Very excited and extremely nervous, I’m just not sure what to expect. I kind of feel like a teenager putting on a party, I’m like 'will anyone show up?' and 'how do I get enough drinks?'. More seriously, I'm pretty happy with my new pieces and its going to be great seeing peoples responses to them. 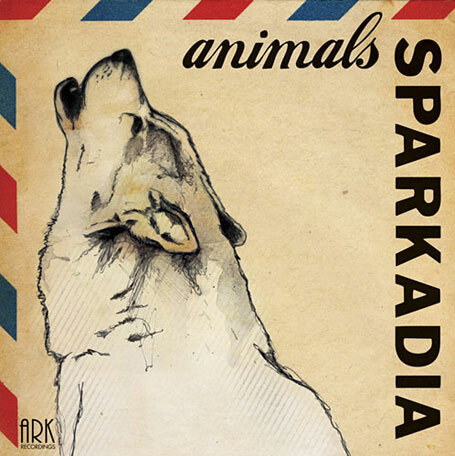 Sparkadia Animals album cover by Kareena Zerefos. I 2. I'm sure many of our readers would absolutely love to earn a living as an artist/illustrator. What path did you follow to get to this point your career? KZ I always wanted to be an artist, but never thought I'd be able to make a living from it, so I took design at the College of Fine Arts – I thought being a designer seemed more viable. Then I worked as a graphic designer, and dabbled in web design, while I continued to draw and develop my style on the side. It's only been the last few months that I've been lucky enough to be able to drop the job, with enough freelance and commission work to keep me fed and the bills paid. 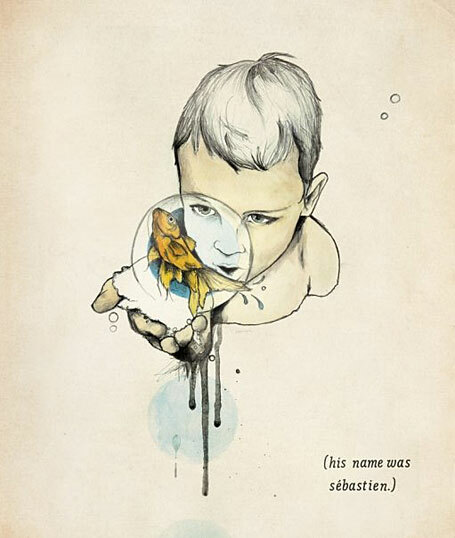 "His Name Was Sebastien" by Kareena Zerefos. I 3. Do you think it's a difficult industry in which to carve your own niche, or do you find that agents/galleries/publications are receptive to new talent & ideas? KZ It is a difficult industry, but I think if you just go with your own ideas and style and really put it out there, you then find that people are always looking for someone fresh. 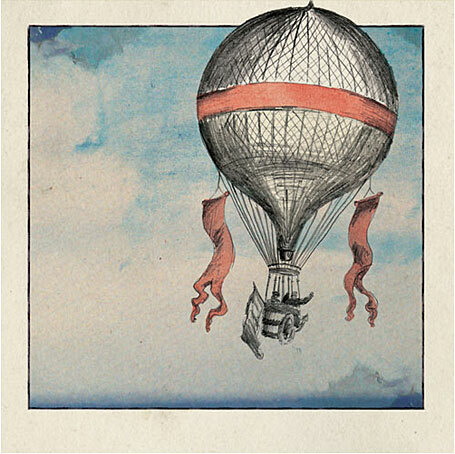 "Hot Air Balloon" by Kareena Zerefos. I 4. You have a drawing style that I personally adore, and it is quite recognisable. Have you always used this approach, or did you develop this style through experimentation over time? KZ My style has very much evolved, and it still is evolving. I originally worked in a way that was based on graphic design techniques and was often finishing my pieces off digitally... but I then found that I wanted my pieces to stay away from the computer, so I started working with different media – particularly letraset, ink and even tea, as well as my favourite pencils, gouache and felt tips. 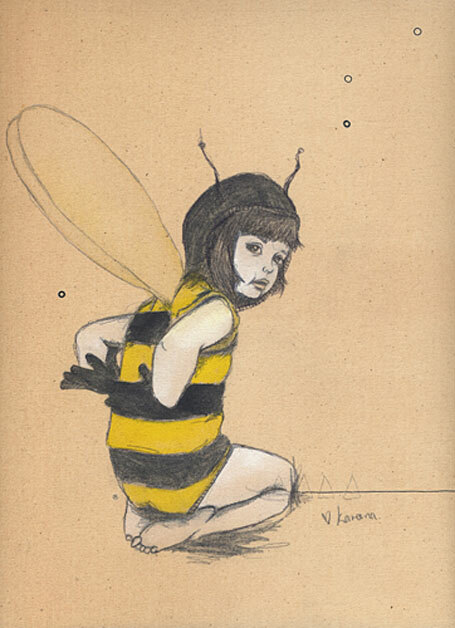 "Bumblebee Girl" by Kareena Zerefos for the Jeremyville Sketchel project. I 5. How did you find exhibiting earlier this year in the Grrrls group exhibition (aMBUSH Gallery, Waterloo)? KZ It was great to exhibit along side so many fabulous female artists. Our styles, materials and techniques were all so varied, but it came together really well. 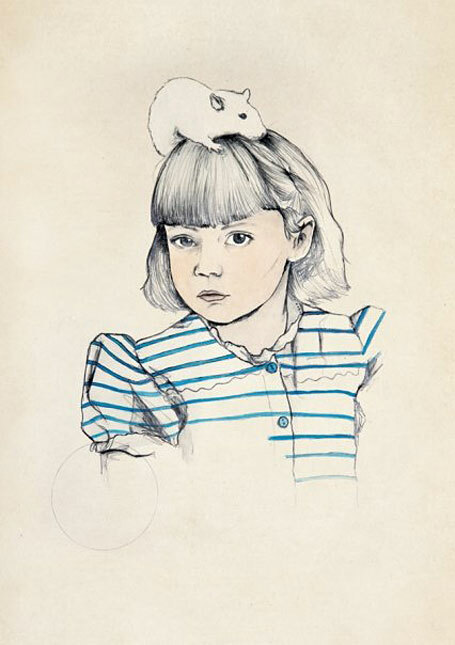 "Girl with Mouse" by Kareena Zerefos. I 6. Have you been to any recent exhibitions that you've just loved? KZ To be honest, I feel like I haven't left my studio for a long time now. So the last show I went to that I loved was Kids Today at MTV. 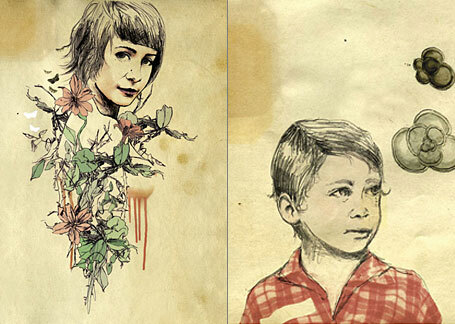 "Portrait" and "Little Boy Daydreaming" by Kareena Zerefos. I 7. From what I've seen, your artworks seem to be based on very personal themes. Your approach seems subtle & emotional. What inspires you to create these works? KZ I work with themes of isolation and escapism – I guess essentially this is inspired by living in my own little dream world, and that feeling of loneliness and the desire to be somewhere else, that a lot of people relate to. I mostly use images of children and their imaginations to depict this, and look at old photographs, film and children’s books to draw inspiration. 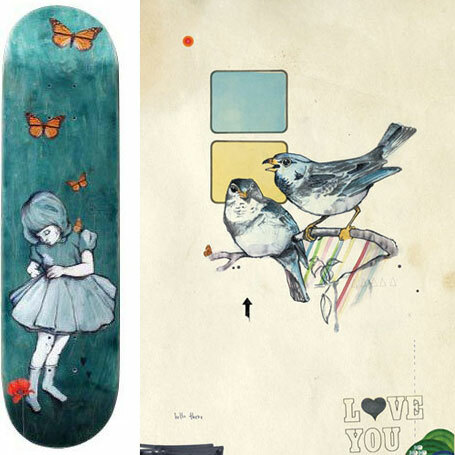 "Across the Board" and "Element Bluebird" by Kareena Zerefos. I 8. Do you have any favourites, or new works you’re particularly excited about? KZ I'm excited about quite a few of my new pieces, I've been drawing quite a few pictures of children with their animal friends and have also done a series of bumblebee children, which have a really nice bittersweet feeling about them. 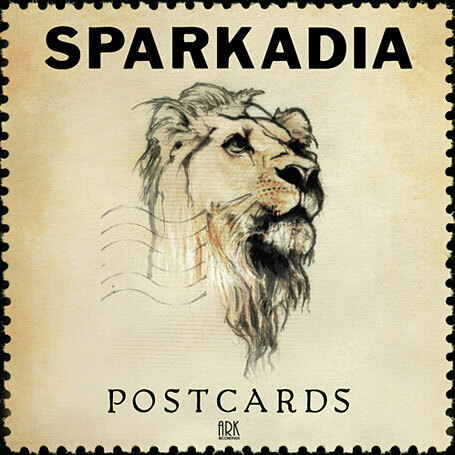 Sparkadia Postcards album cover by Kareena Zerefos. KZ I do! I've recently collaborated with fashion designers, eve and sera from sewn, creating a delicate repeat pattern for their next spring/summer range; as well as sparkadia, with their album, singles and ep artwork; and I just finished up some pieces yesterday working with the mambo goddess designers. ... and thank you! I met Alex years ago at a BBQ and have worked with the band ever since; the Lion illustration came about after Alex and I discussed 'Sparkadia' as being a place or another fantasy world and the lion is the king of the jungle. It is also a reference to the last track on the album, Sleeping Lion, which is one of my favourites. Kareena Zerefos web site screenshot. I 10. Do people discover your artworks through your web site (www.kareenazerefos.com) & online "Corner Store", or do you see the site as a resource for people who already know & love your work? KZ I'd like to think that its for both, I try to keep my site updated with new work and a bit of a news blog so people can come back and see what has been happening. 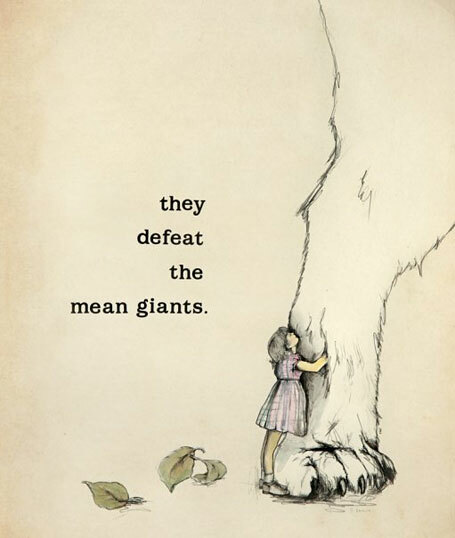 "They Defeat The Mean Giants" by Kareena Zerefos. I 11. What are some of your career highlights so far? KZ This year has been quite exciting in terms of 'highlights' - I quit my job to be an artist full time; I've exhibited work amongst amazing local and international artists at Curvy, Kids Today and Grrrls; and I have just over a week left until my first solo show! 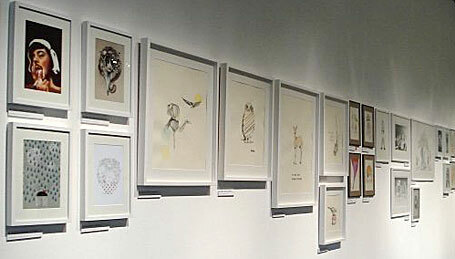 Exhibition of artwork by Kareena Zerefos. I 12. Where are you headed artistically in the future? KZ Doing more of what I'm doing now, continuing to develop my style and hopefully have solo shows in other cities later in the year. I Thank you so much Kareena, and all the best for the exhibition next week - I'm really looking forward to the opening night! 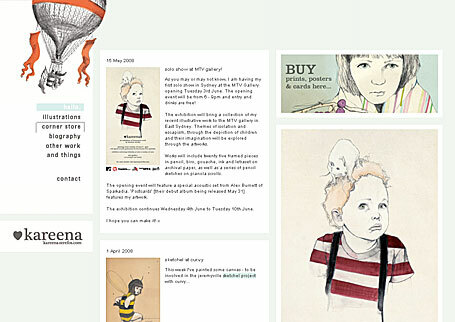 For those of you in Sydney, get along to MTV Gallery in East Sydney (4-16 Yurong St) on Tuesday night, 3.6.2008! The opening is from 6pm - 9pm, and there will be an acoustic performance by Alex Burnett from Sparkadia. If you can't make it to the opening, the exhibition continues until 10.6.2008.